ALABAMA—(ENEWSPF)—February 28, 2017. 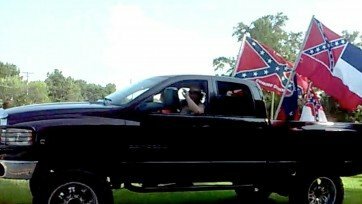 A Georgia judge this week sentenced a man and woman to prison for their roles in terrorizing African Americans during a rally in which they cruised around a rural area in a convoy of pickup trucks adorned with Confederate flags. The pair were among 15 people indicted on charges of issuing terroristic threats and gang activity after the SPLC investigated the 2015 incident and presented witnesses and video evidence to the Douglasville, Georgia, district attorney. Superior Court Judge William McClain sentenced Jose Ismael Torres, 25, to 20 years in prison, and Kayla Rae Norton, 26, to 15. “Their actions were motivated by racial hatred,” McClain said, according to the Atlanta Journal-Constitution. Torres and Norton were among a group calling itself Respect the Flag, which was formed amid a movement to remove the Confederate flag from public spaces in response to the massacre of nine African Americans by white supremacist Dylann Roof. Roof, who was sentenced to death last month in a South Carolina courtroom, had been photographed multiple times with the Confederate flag. The SPLC counted nearly 400 pro-Confederate rallies in the months following the Charleston killings. Norton addressed the victims at her sentencing. She said she regretted attending Respect the Flag’s rallies on the two days when they roved two counties, walked up to cars with guns, threatened black shoppers in parking lots and yelled that they would shoot and kill the children at the party. “The worst decision I’ve ever made in my life was to not walk away when I had the chance,” she said, according to the Journal-Constitution. Two others have pleaded guilty and are serving prison sentences. Others have pleaded guilty to misdemeanors.